Movie follows the adventures of young Mowgli (Neel Sethi), raised by wolves in the Indian jungle (voices of Lupita Nyong’o and Giancarlo Esposito); his closest friend is the black panther Bagheera (voice of Ben Kingsley), his comic relief, the bear Baloo (voice of Bill Murray), and his mortal enemy, the tiger Shere Khan (voice of Idris Elba). In other words, Sethi does a fantastic job of acting with NOTHING. Every character in this movie besides him is computer generated. And it is the best animal animation you will ever see! They’ve come a long way since the wired wolves in THE DAY AFTER TOMORROW (2004) or the plastic deer in I AM LEGEND (2007). The animal movements are so real, it’s as if they mo-capped each animal like Andy Serkis. Not only do they display human emotions on their features, they also incorporate all the tics, ear-twitching, the musculature and fluid movements of their flesh-and-bone counterparts. Mowgli has to go on the lam from Shere Khan the tiger, who wants to kill him for being a “man-cub.” Khan is fearful that, like all men, Mowgli would grow up to be ignorant, arrogant and dangerous, like The Situation, or David Duke, or Donald Trump. This is probably the most cogent message of the film. Most of the other “messages” are as muddled as the usual Disney dope-fests disguised as family entertainment. For example, the animals discourage Mowgli using his ingenuity and tool-usage, like drinking from containers, citing these as examples of his “man” traits that should be stultified – which means they essentially agree with the tiger that Man is wrong for the jungle. 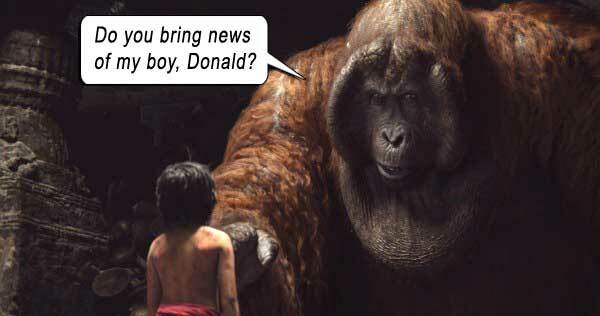 (Mowgli also uses a very modern vernacular for someone brought up by wolves. Where did he learn, “You’re kidding me, right?”) But in the finale, Bagheera admonishes Mowgli that he cannot win against Shere Khan by fighting like a wolf – he must “fight like a Man.” Uh, you mean using my destructive, selfish, avaricious ethos will defeat the natural world of beauty and balance? Tell your kids. Just as Mowgli grabbed a fire torch (which the animals fear and respect, calling it the “red flower”) from the Man village and ran through the jungle inadvertently starting a forest fire, are these the bone-headed traits you want him to employ in the final clash between tiger and human? Apparently, yes. Scarlett Johansson voices the giant constrictor snake Kaa, completely removed from the character in the Kipling tale and from the Disney movie, here telling Mowgli of his backstory (his father killed by Shere Khan), while crushing him in a seductive embrace. She calls the red flower “Man’s creation” – but, uh, no. Fire existed since the Big Bang, with Man only discovering how to utilize it. If one were not literate enough for the Kipling book (to whit: The Situation, David Duke, Donald Trump), and if this film’s target audience were too young to see the Disney cartoon (the last animated film that Walt Disney himself worked on before his death in 1966), this 2016 remake holds up well on its own. Written for the screen by Justin Marks and directed by the powerful and attractive Jon Favreau, they’ve put enough depth into the characters to draw out our emotions: the snake is quite eerie, the panther is majestic and the tiger is regal (all helped by the magnificent animation). Thrilling sequences abound (the buffalo stampede, the monkeys kidnapping Mowgli, panther against tiger, tiger against bear, orangutan against temple, the fiery finale), and I must admit, the motivations and action scenes are much better realized than the Disney cartoon, which was a musical, and therefore, kinda retarded from the get-go, as all musicals are. Mowgli’s journey of self-discovery is supposedly finding a balance between his feral self and his man-instincts. But his man side started that fire, which the elephants had to put out with artificial geography. Mowgli never does atone for that misstep, which inadvertently helped him triumph over Shere Khan. He didn’t use his intelligence to start the fire, or even control it, he just exploited its rage. The elephants, being “the gods and creators of the jungle,” appear loftily out of the smoky foliage and divert a river to quench the fire. They couldn’t arrive ten minutes earlier to help Mowgli against Shere Khan? Which would have negated the need for the fire in the first place. (Been watching the Eagles from LORD OF THE RINGS much?) 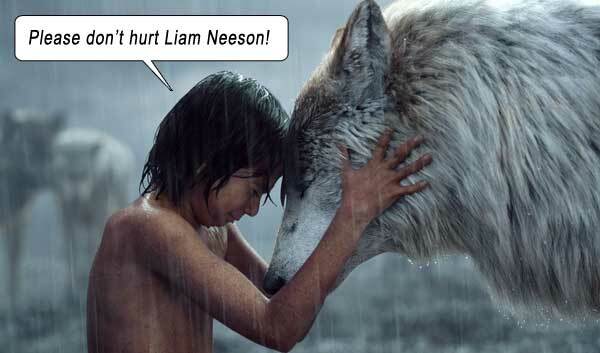 The film never reconciles on how to find that balance between stupidity, destruction, animal instincts and blind luck. But everyone’s happily frolicking in the end. Because – Disney. Writers: Justin Marks, Rudyard Kipling. Starring: Neel Sethi, Bill Murray, Ben Kingsley, Idris Elba, Lupita Nyong’o, Scarlett Johansson, Giancarlo Esposito, Christopher Walken, Garry Shandling.